he Sennheiser XSW 52 Headmic Set Wireless Headworn Microphone System delivers Sennheiser sound quality and performance in an affordable, easy to use package aimed at presentations, instruction and more. 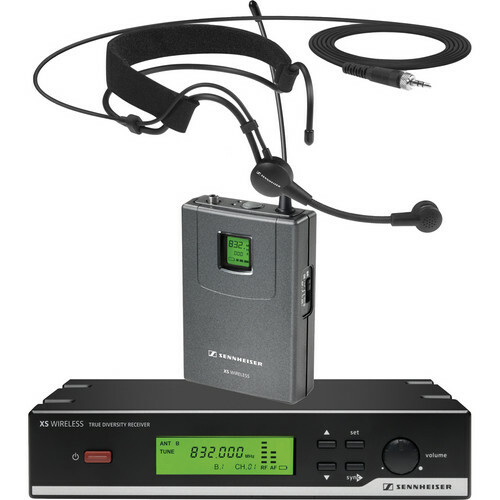 The XSW 52 Headmic Set features a true diversity receiver and bodypack transmitter with an ME3 cardioid headset microphone for hands-free speech capturing. The system operates on the 24MHz UHF frequency band and features 960 tunable frequencies, 8 frequency banks and 12 coordinated channels per bank. True diversity reception greatly minimizes noise, interference and artifacts. Both the transmitter and receiver are capable of remote channel sync, and the transmitter will operate for up to 10 hours on 2 AA batteries. Antenna Inputs	2 BNC connectors, 50 ?